Christmas is a magical time in France, and the markets bring a vibrant energy to the cities and towns of every size throughout France. From the hustle of Paris to the seascapes in Normandy, the markets draw in both locals and visitors for holiday shopping. Explore the colorful wooden stalls that line the boulevards and streets as the marketplaces are filled with a treasure trove of food, local goods, and vintage gear that are sure to be a hit when placed under the holiday tree. Start in the delightful city of Arras, which for a small town has a wonderful market, though the markets of eastern France, in Nancy and Strasbourg, put up stiff competition. The selling season starts in November and often lasts into the early days of the New Year. The port cities like Boulogne, Dunkirk with its famous World War II Operation Dynamo, and Le Touquet provide the backdrop of salty sea air while shopping. Further inland the towns of Amiens, romantic Arras, Bethune, and Lille put on a show for the month. In Lens, visit the Louvre-Lens with its fabulous art from its Paris parent and Licques is famous for its annual Turkey parade. As the region is so close to the U.K., it's a great chance to take the ferry across the Channel and stock up on festive produce to stay energized through those long days to December 25th. After a cancelation in 2017, the Champs-Elysées Christmas Market has moved a few minutes down the road to the beautiful scenery of the Jardin des Tuileries. The garden, located directly in front of the Louvre, is filled with stands selling French artisan wares and local treats like waffles, and crepes. Expect enormous crowds as the market has drawn over 15 million visitors each year. To avoid the throngs, there are many other delightful Christmas markets that can be found by walking through the surrounding neighborhoods. The local markets feel much more traditional than the admittedly, glorious, and chic central Paris location. The Champs-Elysées Christmas Market runs from November 24, 2018, to January 6, 2019. Caen’s traditional Christmas Market takes over the Place Saint-Sauveur in the middle of the town. Pick and choose items from the international stalls that fill the air with the smell of pain d'epices (the French version of ginger loaf) and warm wine. The market has something for everyone's Christmas stocking from foie gras to nativity figurines. There are also other Christmas markets in the region, such as Falaise with its castle where William the Conqueror was born and an excellent location to explore the history of Medieval Normandy. While in the area, try to visit Bayeux and its spectacular tapestry. The Caen Christmas Market is open December 19, 2018, to January 6, 2019. Rouen, the capital of Normandy and the city associated with Joan of Arc who was burnt at the stake here in 1431, pulls out all the stops at Christmas. The magnificent cathedral provides the backdrop to a market with over 70 booths, which offers items from far and wide. There are two ice rinks where visitors can pirouette away and enough entertainment to keep the whole family happy. Rouen Christmas Market is open November 28, 2018, to 30th December 30, 2018. Champagne and Christmas are made for each other. Of all the markets throughout the region, the biggest is in Reims, the capital of Champagne. The city where the French kings were crowned for centuries in the cathedral, Reims is a UNESCO World Heritage Site and it’s a stunning place to celebrate Christmas. You'll find135 chalets dotted around the city in different locations; there’s a big wheel on place de la Republique, and the main market takes place on place d’Erlon, and on rues Condorcet, de l’Etape and Buirette. There's also the Children's Kingdom where the kids can meet Father Christmas, ride a train, and partake in free ice skating. Nearby is the Craft Market offering ceramics, jewelry, and other handmade objects. Drive from Reims to any of the other nearby towns, and you’ll get a whole range of different Christmas markets. Reims Christmas Market is open November 21, 2018, to December 28, 2018. Alsace is a particularly magical place for Christmas markets. Situated near Germany and Switzerland, the area takes inspiration from all three countries. Strasbourg began its Christmas markets back in 1570, making it the oldest in France. At the crossroads of Europe, the market at Strasbourg has an international atmosphere. The 300 stands of the market spread out throughout the city, with the center in Place Broglie and Cathedral Square. There’s a huge Christmas tree in Place Kleber and an ice rink outside the magnificent cathedral. For Alsatian food, go to the place des Meunieres; the three kings are to be found in Place Benjamin-Zix, and the 'Golden Square' is located on the place du Temple-Neuf. Wines are sold on the place d’Austerlitz along with local food delicacies, and in the commercial Galerie de ​l'Aubette you’ll find a book market. 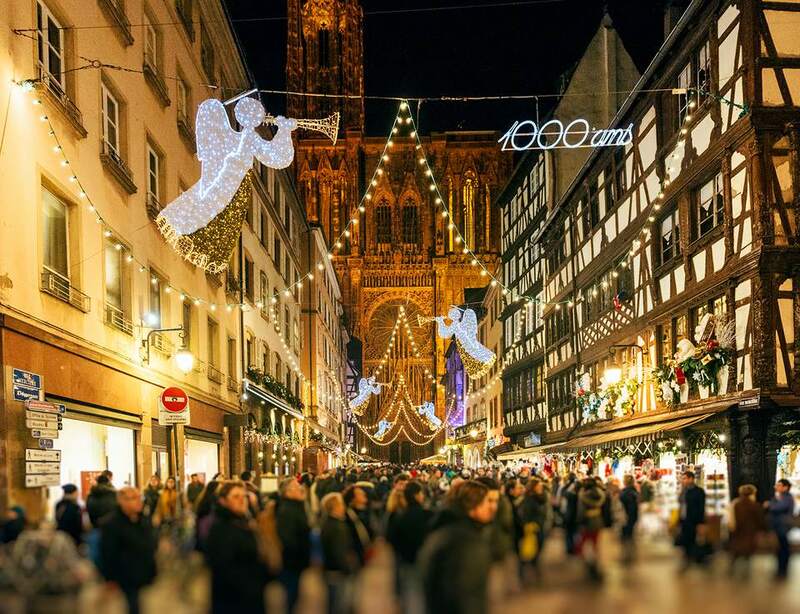 Strasbourg Christmas Market runs November 23, 2018, to December 30, 2018. Colmar may be famous as the birthplace of Frederic Auguste Bartholdi, the sculptor of the Statue of Liberty, but at Christmas, it’s equally well known for its market. The pedestrianized center is full of old houses and cobbled streets, adding to the Hansel and Gretel atmosphere that seems to take over all cities in Alsace in December. There are five markets in the old town of Colmar. The place des Domincains has around 50 chalets, against the backdrop of the illuminated church stained-glass windows. Families with children go first to Petite Venise (Little Venice) for wooden toys, stocking fillers and sweet things. There’s also a postbox for letters to Father Christmas, a wooden merry-go-round and a Nativity. Arts and crafts, from paintings to jewelers and second-hand booksellers fill the Koifhus covered market; and more stalls outside cluster around the fountain. For local crafts and food, make way to the place Jeanne d’Arc. While visiting, don't miss one of Europe's greatest sacred works of art, the Issenheim Altarpiece. Colmar Christmas Market is open November 23, 2018, to December 30, 2018. Mulhouse is well known as a textile town with its Museum of Printed Fabrics a popular attraction. Each year the city has a new fabric designed which decorates the stalls throughout the city, and the museum hosts a market just selling fabrics. The main action is in the Place de la Réunion in the old city center. The impressive Hotel de Ville (City Hall) is illuminated, overlooking the 50 stalls that offer all the right goodies. In the Place de la Concorde, awaits a traditional Hungarian arts and crafts village, and if you want music, make your way to St Etienne church for concerts of Christmas music. For car fanatics, the National Automobile Museum, the Schlumpf Collection is a can't miss attraction. Mulhouse Christmas Market is open November 24, 2018, to December 27, 2018. Christmas kicks off in Nancy on Saint Nicholas Day. St. Nicholas is the patron saint of the weak, oppressed, and children, and although the official holiday date is December 6th, Nancy celebrates early on the weekend of December 1st and 2nd. In the afternoon of December 1st, street entertainers enthrall the crowds until the fireworks show at night on Place Stanislas. The St. Nicholas Parade is on December 2nd when Santa gives out gingerbread figures; his rather more sinister companion, Pere Fouettard or "Whipping Father," dispenses spankings to boys and girls who have not been good during the previous year. The Christmas market starts at the same time, mainly in Place Maginot where you can pick up local food from fresh bread to charcuterie, Bergamotte bonbons, and Mirabelle liqueur. There are street entertainment, carol singing, and folk dancing. Saint Nicholas Weekend is December 1 and 2, 2018. Nancy Christmas Market runs November 24, 2018, to December 30, 2018. Start at the town hall in Avignon for a look at the spectacular nativity scene, then compare it with others in the Palais du Roure and many of the Provencal city’s churches. The buildings are specially lit up, and travelers can stroll through the pedestrian-free center with ease. There’s a winter village of 60 stalls offering all those tempting Provencale-style gifts that make the southern Christmas markets so different from their northern counterparts. The main market is on the Place de l’Horloge with stalls and entertainment filling the surrounding streets as well. Buy the local magnificent santons figures (painted, fired terracotta nativity figurines), Provencal fabrics, jewelry and candles, and stock up on nougat, candied fruits, chocolate, and spicy cake. Avignon Christmas Market runs throughout December.